When luxury is freed of all ballast, it moves to a new level. 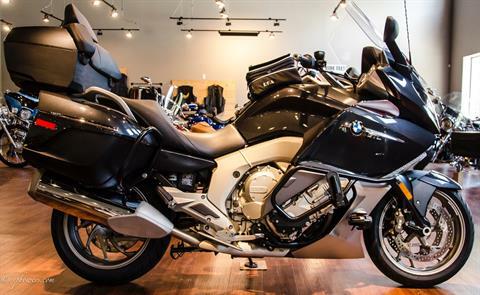 At the very top of this evolution is the new K 1600 GTL - a high-class touring bike like none before it. With the most compact and efficient in-line six-cylinder engine ever installed in a series production motorcycle. The ergonomics of the K 1600 GTL are designed for long trips and leave nothing to be desired for either rider or passenger in terms of comfort. The slim design in the area of the rider's seat and the fact that the handlebars reach far back allows a relaxed seating position - for hours and over hundreds of miles. The pillion passenger enjoys a sizable seating area and a comfortable backrest. Available for the first time in a motorcycle, the adaptive headlight (special equipment feature) - a revolution which matches the visionary front section of the K 1600 GTL and provides the very highest level of active safety. The GTL makes luxury light-footed. This is because its unique chassis provides excellent handling. With a totally direct ride feel due to the ground-breaking Duolever front suspension. At the rear, it is the Paralever that puts the power of the engine onto the road, The optional ESA II (Electronic Suspension Adjustment) ensures that the GTL always glides completely smoothly since the systems allows the damping and suspension to be adapted according to situation and preference at the press of a button. Every detail is designed for maximum riding pleasure. A motorcycle for people who are looking for a new kind of supremacy. K 1600 GTL. Unstoppable tour.